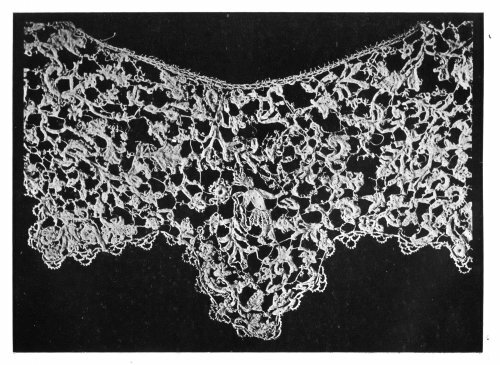 Here’s a second installment in the series entitled ‘History of Lace.’ You can find the first article here. Without much talk, following are some works of art of those who have been image setters throughout the centuries. 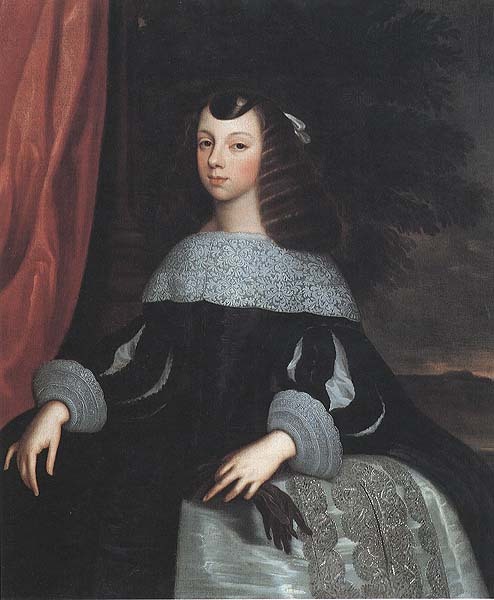 Although Catherine of Braganza was not much popular in England, for she was a protestant, and she failed to bring an heir to the throne, however, she was the one who introduced the custom of drinking tea in England, in addition to using the fork at the royal dining tables. It’s difficult not to admire her portrayed simple elegance! Queen Elizabeth I, a 16th century influential figure. A portrait attributed to Georges Gower. 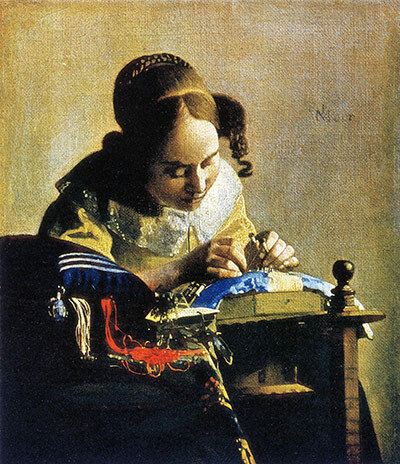 The Lacemaker by Johannes Vermeer, 17th century. Charles I. was executed on the 30th of January, 1649, for refusing to accept parliament’s rights to cut off expenditure, and control taxes. Charles I & Henrietta Maria of England, by Van Dyck. How ridiculously extravagant showing off ones wealth could be? Prince Charles Louis & his brother, Prince Rupert, used to wear lace collars over their metallic body armors! Marie Antoinette, by François-Hubert Drouais, was painted in 1773, while she was still 18. This is the first installment of a series of articles entitled ‘History of Lace,’ that will be posted in succession. As I have always been fascinated by hand made lace, I have tried to collect information about the history of this inspiring craft, and how it spread in Europe. The first steps of lace-making were taken in the lands Pharaohs of Egypt, where hair nets and fine flax clothes, decorated with colored threads, precious stones and gold, were found in many tombs of the royalty in the Thebes, some dating to about 2500 BC. The romans later on caught the trend, and adorned the edges of their robes with golden lace threads. 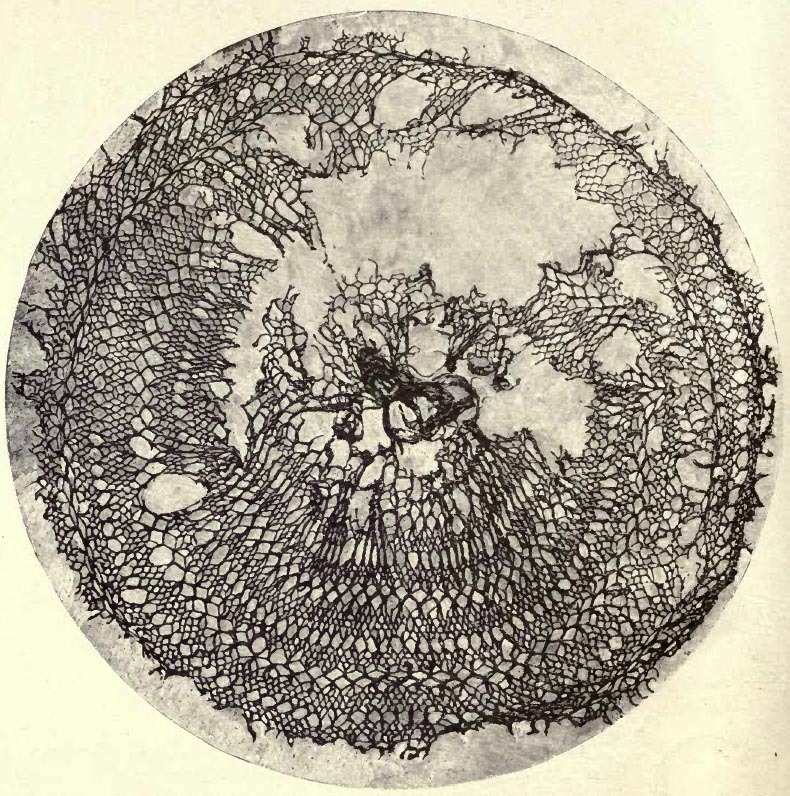 Gradually, the craft of lace-making was developed into numerous types, by several cultures, each customizing its own design trends and methods. A fine example of antique gold lace was discovered in St Cuthbert’s coffin, who died in 685 A.D. But not until the fifteenth century did this beautiful fabric, now called ‘point lace,’ became widely spread in Europe. It was first mastered by the nuns in Venice in order to add to the income of their convents. Another early traces in Europe go back to Flanders, Belgium. France, as always, lead the train of fashion in the sixteenth century. Under the name of ‘Lacis,’ it became known during the reign of Catherine de Medici (1519-1589), who summoned the most famous lace maker and designer in Venice, Federico di Vinciolo, to live, teach and work in France. 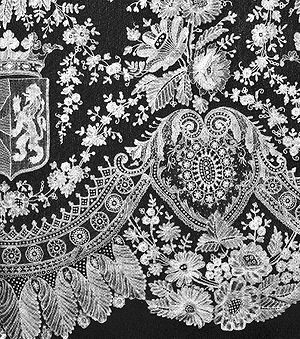 But it was during the age of the Grande Monarque, Louis XIV that the French lace matched the perfection of that made in Venice. With the mass persecution of the Protestants, they fled to England, bringing with them their arts of lace-making and silk weaving. This led to the introduction of English lace, mainly during the reign of Queen Mary. But not until Queen Elizabeth’s times that lace became so trendy, and was developed in various shapes and forms. At that time, lace was filthy expensive, to the extent that it was rumored that nobility gentlemen sold their estates in order to buy lace gifts to impress their adornments! In short, the art of lace-making tells a great deal about both the crafter, and the consumer. The former definitely owns a lot of patience (for a simple mistake means unwinding hours, if not days, of hard work), attention to details, and perfectionism. While the latter is definitely a person who strives to constantly be unique, by being immersed in the pleasures and the beauty of this world, which is a privilege that was only given to those of a certain prestige, the non-working class, during the older times. I got back from another blissful visit to Egypt, to find out that my beloved grandmother has a brain tumor. She passed away on Friday the 13th, two weeks after I arrived. Just like that. That enchanting, lively being swept away, so fast before I could properly say goodbye. Just as my grandpa, my muse, did one year, nine months and twelve days before her.. I tried to stay focused, in order to overcome my grief. I went to work. Had long and lovely conversations with friends & family, and worked on a few projects for my blog that every time I come close to posting them, I just fail. Yesterday was my birthday. It could have gone by meaninglessly, as I wanted it to be, if not for my thoughtful friends. Those who keep on bringing joy to my days. Today, on the very first day of my own new year, I am full of hope. I’ll be utilizing every positive atom of my being. I am longing for success, for new projects and aspirations, and for beautiful and peaceful times… And I plan on sharing those amazing glances of my time on earth with the world! Sounds like they’re from outer space, no? They are the ancestors of most of the great civilizations that now dwell all over the Mediterranean shores. They were the world’s oldest sea and inland merchants of antiquity. The ones who sailed around and identified all Africa, way before Vasco De Gama did, who explored the Atlantic shores of Europe long before the Romans has ever existed, and many historians even argue that they have crossed the Atlantic ocean and communicated with the ancients of the ‘new world’, more than two thousand years before Columbus has achieved that. They laid down foundations to mathematical theories, and that were developed by the Greeks later on. They’re the inventors of the first Alphabet that also was passed along to the Greeks: It is almost the same one we are using today… And, we awe them for the color purple! They called themselves the Canaanites, but were known as Phoinikes by the Greeks, which literally translates to: ‘The Purple People,’ or, the Phoenicians. The significance of the Phoenicians relies not only on their great impact on the human civilization for a whole Millennia, but on the examples they set for us on how to live life today. They were people who lived in complete elegance, by all its means. They never mastered the skill of war, instead, they mastered architecture. They built advanced royal, war and cargo ships using the famous luxurious Cedars’ wood, and were known for their majestic temples and fortresses. They were also renowned diplomats: the Phoenicians had the most advanced law and governance institutions of the time, according to the great Aristotle in his De Politica book. They were the founders of what is now called ‘The Maritime Law,’ the law which still governs sea trade. The Purple People planted colonies, instead of conquering existing ones. These developed into great cities of their own, like: Boeotian Thebes, Crete and Rhodes in Greece, Carthage and Utica in Africa, Cadiz, Tartessus and Lisbon in Spain and Portugal, and several others on the shores of the Black Sea. Even though the Phoenicians themselves maintained high-profile lifestyles on a daily basis, as they wore the best of clothes and accessories, and women had sophisticated hair up-do’s everyday, they were still hard-working masters of their own crafts, and enjoyed doing so. They had famous artistic skills, like metal modeling, Ivory sculpting, jewelry making, and fashion design! They were especially famous for the color purple, that they extracted from a shell called the Murex, found only on the Phoenician shores. Their uniquely designed and purple colored textiles was worn solely by kings, as an indication of high status, for they were highly priced by the Phoenician traders. Image via Wikipedia. The discovery of murex by the Phoenician god Melcarth. Artwork by the Flemish artist Peter Paul Rubens in 1636. Discovering the color purple goes back to the Phoenician mythology, where Melcarth (known as Heracles by the Greeks) was walking along the shores of his city Tyre, when he found his dog playing with Murex shells and his muzzles stained with this charming hue. It was initially called the Tyrian purple, referring back to the city now located in southern Lebanon, that was 3000 thousand years ago, the center from which the Phoenicians roamed the land and the seas, exclusively ruling the trade of their luxurious goods. It is very interesting to read how the dye was used to be extracted from the Murex here, in addition to a comprehensive historical timeline on the Phoenicians’ purple lace status and trade throughout a whole Millennia. 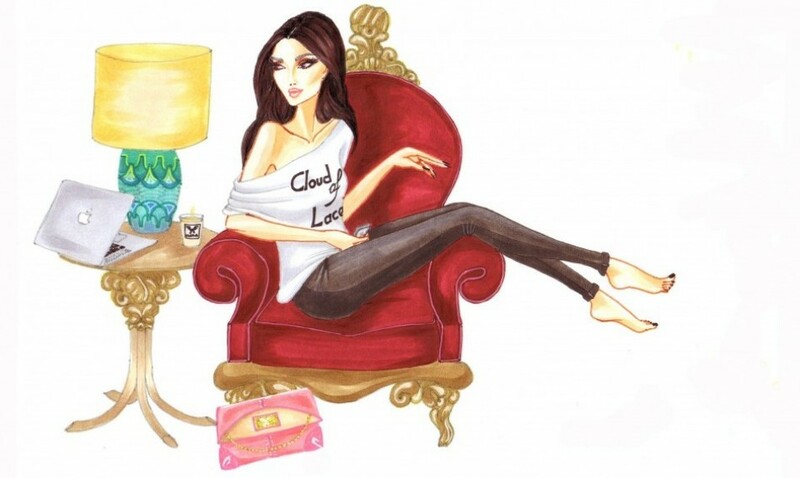 ‘A new shoe brand, designed for the modern Lebanese woman who enjoys shoe-fashion.’ This is how Ibtihaj Matraji Demachkie describes her newly established brand, Dentelle Hand Made. The Winter 2011-2012 is only her second collection, after starting on May 2011 with a summer collection that constituted of 13 different flats models, and only 1 pair of heels. She has sold over 160 pairs so far, participated in many local Lebanese designers exhibitions, and a gave a few TV interviews, all without relying on any formal marketing strategy -yet! Check her Facebook group here. 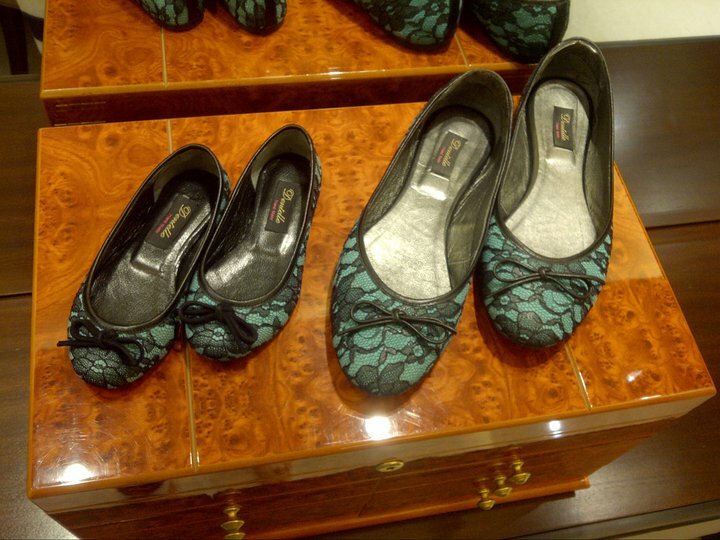 Dentelle’s items are showcased at some Lebanese Designers shops in Beirut. That’s how I discovered the brand last year. However, not until recently that I got the chance to meet the person behind those feminine, chic and ultimately comfortable ballerinas I got! After designing the shoes, the real making process takes around two months. She carefully selects the material herself, and then agrees on the cutting and finishing. Even the packaging of the shoes is also handmade, and so attractive! Despite her being pregnant with her first baby, she’s working on her third collection, the 2012 Summer collection that should be out by May. According to Ibtihaj, it’s going to feature what’s hot right now: The snake print leather, attractive fluorescent colors and Swarovski crystals… Can’t wait! 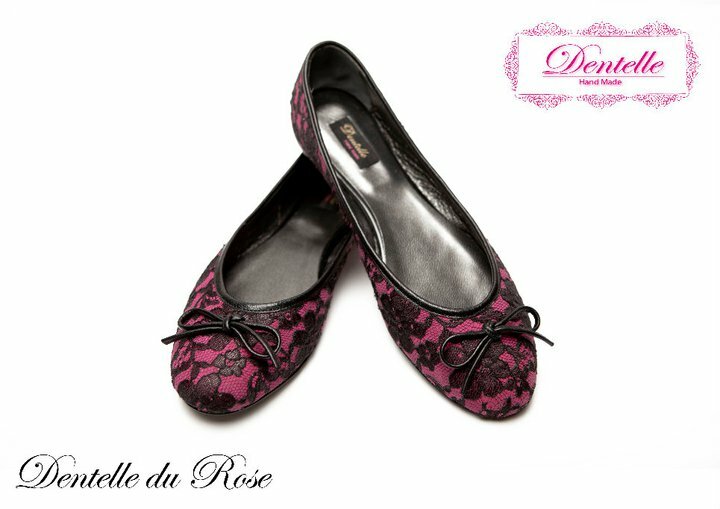 Dentelle also debuted a Mother & Daughter ballerinas collection! More are coming up.. Now that’s cool! Following up on my cooking mania this week. I’ve decided to bake something that doesn’t take much of a preparation time, has white sauce, healthy but quiet fulfilling (i.e., contains carbs, duh!) all at the same time. I looked online and found an amazing one here, but of course, I altered the recipe & did it my way.. Ingredients: 5 tbsp virgin olive oil, 6 cups of thinly sliced onion rings, 1 tbsp fresh thyme leaves, 1 tbsp light & unsalted Butter, 5 medium-sized potatoes (I didn’t peel mine), 1/2 cup light cooking crème, 3 medium/ sized tomatoes (choose ones with a diameter approximately equal to that of the potatoes), 1/4 cup slices basil, Salt & pepper to taste, parmesan or Gruyère cheese as a topping. Directions: Place a pan over high heat until hot, then add 3 tablespoons olive oil, the onions, 1 teaspoon thyme, 1 teaspoon salt, and some pepper. Cook for 6 minutes, stirring often, then turn down the heat to medium and add the butter. Cook an additional 10-15 minutes until the onions start to caramelize. Turn the heat down to low and continue cooking until the onions are a deep golden brown, another 5-10 minutes. Turn the heat off and set aside. Pre-heat the oven to 180 degrees C. Slice potatoes into around 2cm thickness, and put them in a bowel with the cream, 1 tbsp thyme, 1 tbsp salt and some black pepper. Slice the tomatoes into 1cm thick rounds as well, and season them with salt & pepper. To layer the gratin, first add half caramelized onions in an even layer at the base of the baking dish, and add the potatoes and tomatoes in an alternating way, then sprinkle some cream (from the leftover potato bowl), and one tbsp olive oil. Season with a dash of salt, black pepper, thyme and half the basil. Repeat the layering with the remaining ingredients, making sure the top layer looks pretty! Press the layers slightly with your fingers, the cream should come up & coat the layers evenly. Combine one handful of whole grain flour with 2 egg whites, a sprinkle of vanilla (could be replaced orange, maple, blueberries, almond..), 1-2 tbsp water, and a dash of cinnamon. Mix well and then place in a heated pan. Flip after a couple of minutes to create something that looks like a pancake. 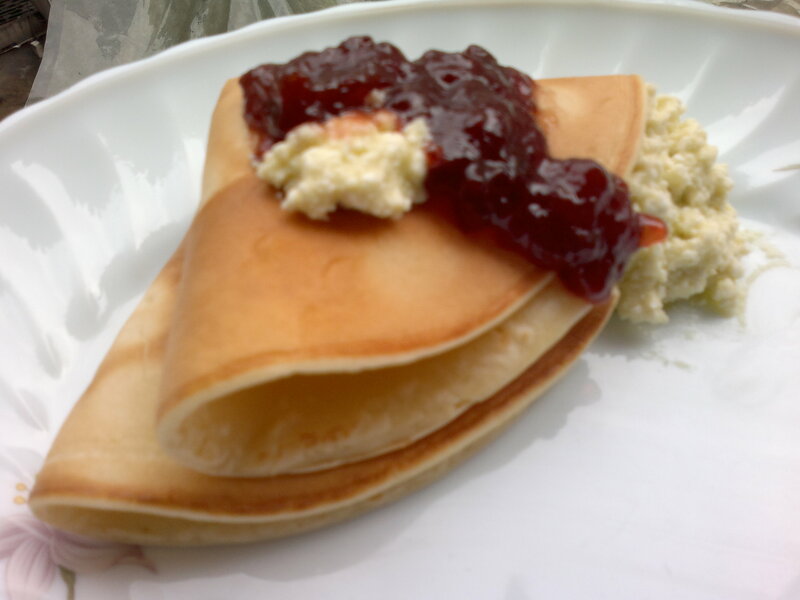 I topped mine with 2 tbsp of fat-free cottage spread cheese (that’s what I had in my fridge) & 3 tbsp of homemade strawberry jam (also cause that’s what was available in the fridge! ), and two table spoons of warm maple syrup. This breakfast has the ideal balance of proteins and carbs necessary to keep me going for the day, & it happens to be wonderfully tasty, all under 250 calories!! Winter is by all means my favorite season. Being back from vacation, I carry loads of excitement to start on new projects, and host some family gatherings. Cloudy skies and chilly temperatures always dictate soups for me. I mostly felt like a mushroom soup, made with a twist. I found one interesting recipe here. It turned out mouth-watering! Its ingredients are available at home or easy to find at any local grocery shop. I couldn’t find Dried Porcini though, so I substituted it with canned ones, water-based. 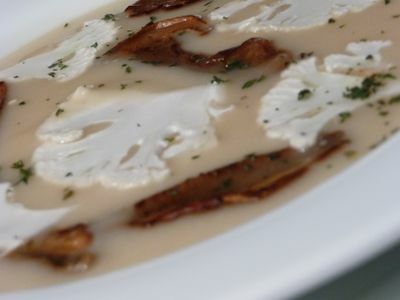 Recipe: 1 medium cauliflower, 1 medium-sized onion, 6 tablespoons light butter, 1/2 cup canned mushrooms, 1 sprig of fresh thyme, salt and hot black pepper to taste. Segment cauliflower saving some good-looking pieces for decoration. Cover them in a bowel with enough water (enough just to cover them), add butter, salt & pepper. Cook on medium-high heat until the mixture is very soft, then purée the cooked cauliflower adding cooking liquid (or molten meat sauce cubes), until it has the desired consistency. The resultant has to be thick, but not too thick, so you can add cooking liquid when necessary. Boil the mixture while stirring on a low heat. In a side pan, sauté chopped onions, then mushrooms in two tbsp of butter until golden, then add to the puréed mixture. Shave reserved cauliflowers, then add to the soup along with chopped thyme. Serve hot, & Bonne Appétit! It’s perfect with traditional rice, or even as sauce for a beef steak. Notes: 1, Always rinse canned vegetables thoroughly, it helps to get rid of some of the extra added salts & preservatives.